Germs, germs everywhere. Not enough sleep, too much fast food. 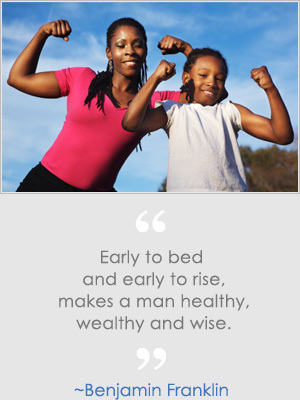 The health of you and your family is precious. Don’t stress over it (that’s bad for you). Keep it simple and stick to the basics. Snack tip: For energy that will last, mix your carbohydrates with your proteins. Fruit and cheese kabobs, milk and animal crackers, peanut butter and celery, apples and peanut butter. Kid friendly workouts: Relay races, Obstacle course in the back yard, Hoola-hoop contests, freeze tag.